It's time for another Going Grey at Scrap-Creations Challenge. I'd like to thank Kristen for having me join in this past month as a Guest Designer! This weeks challenge is a sketch. I used Origins from Basic Grey for this weeks challenge. The beautiful flower image is from Fred B. Mullett (item FBM_365). I inked the flower with Ranger Distress Ink Mustard Seed and Peeled Paint, stamped on Confetti card stock, then cut out using Spellbinders Oval Dies. I sponged the edges in Chocolate Chip, then added the Cracked Glass Technique, distressing with Old Paper Distress Ink. The sentiment is from Our Daily Bread Designs. Beautiful! The flower looks so distressed using the cracked glass! Very pretty! 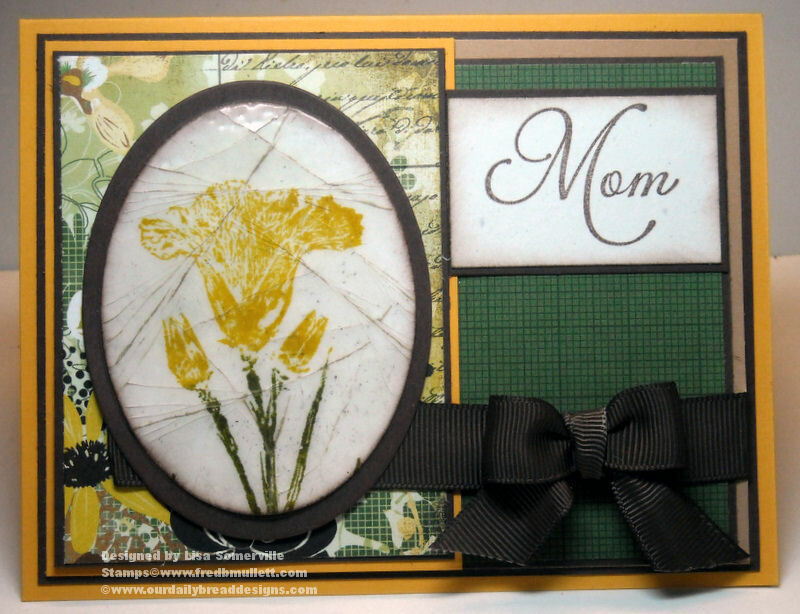 Love the bright yellow flower and the way you crackled it! Gorgeous, Lisa! Love the cracked glass flower!! GORGEOUS!!!! your cards are always so wonderful. Thank you for playing with us!!!! I love the cracked glass technique and yours looks great! So pretty! The cracked glass adds so much to an already great card! Absolutely gorgeous! Love the cracked glass look and what a lovely flower! Just lovely! I have never seen that technique before. Looks great. Is it a lot of work to accomplish that cracked glass finish? Fantastic cracked glass! Beautiful card! I am loving your flowers that you keep using as your images. Gorgeous! Lisa this card is gorgeous! I love that flower under cracked glass. Beautiful job with the sketch this week! what a beautiful card. Love the look of the flower - looks like broken glass.